As Australians, we know that once the Christmas season begins, it’s time to bust out the sunnies, pack the esky with some cold beverages, and get out there and enjoy the kind of weather that’s hotter than a shearer’s armpit. However, for much of the rest of the world that finds itself in the northern hemisphere, things are a bit different—to quote a popular book and television series, “Winter is coming.” But temperature isn’t the only difference about Christmas in Oz; in fact most countries have their own unique traditions associated with celebrating the world’s most popular festival, and we’d like to share a few with you. 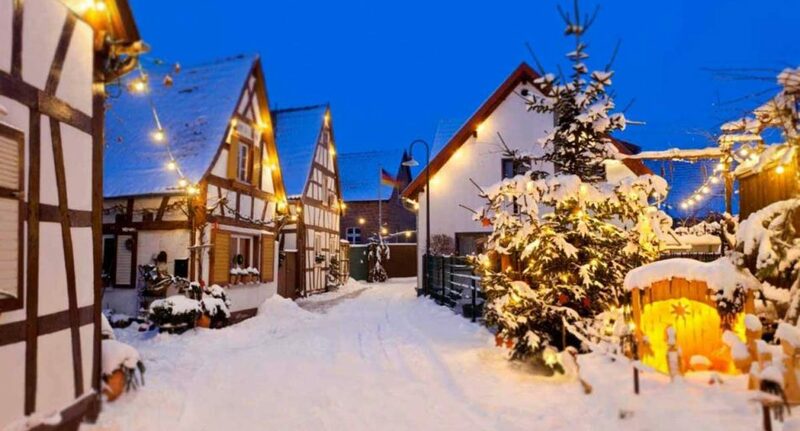 Here are ten countries that enjoy Christmas in their own special way. Although many people have a general idea of how Christmas is celebrated in the United States (thanks to movies and television), it’s important to note that there are actually many different Christmas traditions in America, due to the fact that the United States is a country which incorporates many different cultures. However, there are a few relative constants across the whole country. The “Christmas Season” normally begins on “Black Friday,” which is the day following the observance of American Thanksgiving Day. This day is important to Christmas shoppers and businesses, and kicks off an entire month’s worth of increased spending. Of course, despite its commercialism, Christmas is also a time of charity and volunteer work. As for the festival itself, it generally involves gifts being shared between family and friends, family dinners consisting of turkey or ham, and festival-themed entertainment. As for the religious significance of the festival, many Christian families will attend special church services and make direct efforts to focus their celebration around the birth of Christ. Although most of Brazil is located near the equator, a portion of the country extends fairly far south, which means that for many Brazilians, Christmas is a summer holiday (just like in Australia). However, the presence of snow is still considered important, so many Brazilians will decorate their Christmas pine trees with bits of cotton to symbolise the snow that won’t be falling during the celebrations. Brazilians have a particular fondness for nativity scenes (called “Presépio”) which are often displayed in churches, homes, and even commercial establishments. A traditional Brazilian Christmas meal generally consists of roast turkey or chicken, accompanied by rice, beans, vegetables and fruit. The meal is usually held late in the evening on Christmas Eve, and then followed by attending Midnight Mass. Christmas decorations often incorporate fresh flowers picked from the family garden. The first decorated Christmas tree was erected in the home of protestant reformer Martin Luther, who used candles to simulate the look of stars shining through tree boughs3. The Christmas tree is still revered in Germany, and is generally put up and decorated in the home on the morning of Christmas Eve. The Christmas festivities, however, begin much earlier on December 6th, on Saint Nicholas’ Day. Children place a shoe or boot into the house fireplace, and when they awake in the morning, the shoe will be filled with tasty treats. Santa Claus—or Saint Nicholas—is often depicted as being accompanied by Knecht Ruprecht, a demonic-looking helper whose job it is to punish bad children. Most German families open gifts on Christmas Eve, and have an unusually large Christmas Eve feast. In fact, there is a tradition that states that those who do not over-eat on Christmas Eve will be tormented by demons throughout the following night! Christmas observance by Christians in Iran is generally more focused on the religious aspect of the festival than on the commercialism. Christmas day is preceded by the “Little Feast,” which begins with a fast that starts on the first day of December and ends on December 25. During this fast, participants abstain from all animal products (such as meat, eggs, milk, and cheese). During the month of December, Christians attend many church services, culminating in a pre-dawn Mass. At the conclusion of the fast, the feast begins, and a grand Christmas meal is held. As a general rule, gifts are not exchanged during Christmas, but most children do receive new clothes to wear on Christmas Day. Although for many years Christmas was only celebrated in Japan by the relatively few Christians who had been converted by missionaries from the west, in recent decades, western media and commercialism have caused a surge in the celebration of Christmas. Today, Christmas in Japan is observed through intensive gift giving, and shops capitalise on this by decorating their store windows with Christmas trees, lights, and other traditional western iconography. For many Japanese, Christmas is considered a romantic holiday, much like Valentine’s Day, and restaurants are often booked to capacity on Christmas Eve with couples sharing a romantic dinner. On Christmas day, families often enjoy a meal of fried chicken, with a dessert of traditional Christmas cake. Christmas in Nigeria is a very family-centric occasion, and many who work and live in larger cities will travel many kilometres to return to their home villages. The entire month of December is celebrated with the use firecrackers, and festivities themselves often extend even into the first week of January. The largest celebrations occur on December 24, and generally last until late in the evening, at which point the party goers leave to attend church. Gifts are usually given to those who are less fortunate, and are normally financial in nature. Despite the ongoing revelry throughout the month, Christmas day itself is generally reserved for family time, with most Nigerians electing to spend the time quietly at home with their loved ones. The overwhelmingly large Catholic population of the Philippines ensures that the country’s Christmas celebrations are long and festive.5 In fact, the “Christmas Season” in the Philippines lasts longer than in any other part of the world, with Christmas music being played on the radio as early as September! In addition to many adopted western traditions, the people of the Philippines also have Christmas traditions that have grown from native customs. The most popular Christmas decoration is the “parol”, which is bamboo frame topped with a lighted star lantern, which represents the star which guided the Three Wise Men. Christians attend nine separate dawn masses, beginning on December 16 and continuing through December 25. In Russia, Christmas is normally celebrated on January 7, due to the fact that the Russian Orthodox Church uses the Julian calendar for religious celebrations.6 The celebration itself is generally more religiously themed than commercial, with special long church services being held on Christmas Eve, after which families will often return home to enjoy a massive 12-dish meal known as “Holy Supper.” Some Russians choose to fast on Christmas Eve, abstaining from food until the first star appears in the sky that evening. Wishing you & yours a truly great festive season and happy & prosperous 2015 – from the Budget Direct team.